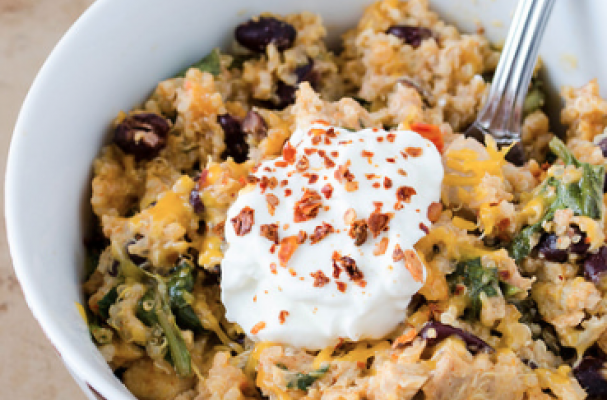 Quinoa casseroles are a great way to pack extra nutrition into each and every meal. This recipe gives casseroles some flair and incorporates Southeast Asian flavors. I've also added a ton of hearty root vegetables for added color and texture. To bump up the protein, feel free in mix in some rotisserie chicken or cubed extra firm tofu. Step 2: Heat the olive oil in a large saucepan over medium high heat. Add the onion and garlic and cook until fragrant, about 30 seconds to 1 minute. Add the curry paste and continue cooking. Next, add the coconut milk and sriracha and mix ingredients until well combined. Cook for 3 to 5 minutes until coconut milk has slightly thickened. Remove from heat. Step 3: Add the vegetables and cooked quinoa to a baking dish. Pour the sauce over the top and mix until sauce and ingredients are evenly distributed. Step 4: Bake the casserole for 20 to 25 minutes until golden brown and bubbly.